We loved the cabin! It was the perfect location! White Water Rafting was great and so was the mountain top, zip lining at NOC. We had an amazing hike up to the fire tower on the Appalachian Trail. The view was breath taking! We strongly recommend taking that hike. 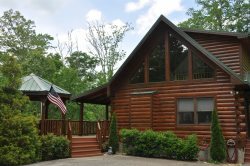 As for the cabin it was very clean and a great location and we can not wait to book our next vacation here. Thank you again for making this a great experience. I think we may have had one of the best cabins in the Great Smoky Mountains! We were here for our honeymoon and it was amazing! The view was outstanding. I recommend the trains, NOC for rafting and zip lining, deep creek trails and tubing and waterfalls. We enjoyed our stay so much. Everything about the cabin was wonderful. I don't think that there was a better view on the mountain. WE rafting on the Nantahala , hiking and tubing at Deep Creek. We were just as happy to sit on the porch relaxing. Thank you for sharing your home with us. And for being pet friendly. Really enjoyed our stay. The cabin was the perfect size with all the needs of home. We look forward to visiting again. We had so much fun on this trip. We Loved sitting in the gazebo drinking coffee. We went hiking to several waterfalls, went boating, fishing and even went tubing. We celebrated Fathers Day here by cooking breakfast for all of the dads and gave them there gifts. We hate to leave after such a wonderful week. Thank you for opening your cabin to us. We will miss the beautiful view. Thank you again for such a memorable week of our family bonding. I think we may have had one of the best cabins in the Great Smoky Mountains. We were here for our honeymoon and it was amazing. The view was outstanding. We had a wonderful time here! The house is beautiful and so comfortable for our family of five. There is so much to do in this area. If you enjoy the outdoors. We hope to come back for another stay. We had a wonderful time! The view was breathtaking. Over all our trip was fantastic. We enjoyed our stay at Big Bear Retreat. It was a cozy and felt like home. The hot tub is amazing and the view is even better. We will be back again. Thanks for having us. My Husband and I have vacationed here in the Great Smokey Mountains many times for the years. This was our most memorable! We were really impressed with your lovely, beautifully built and overlooking the mountains. I am now 5 years out from my recovery from breast cancer and treatment. Thank you for sharing this wonderful celebration of life in this cabin. WE enjoyed our first trip to the Smokey's! Hiked all the beautiful spots. Saw lots of waterfalls, don't miss Mingo Falls n Cherokee. Don't miss the ice cream sandwich's at The Filling Station. We can't wait to come back. We enjoyed our stay at this cabin. It was cozy and felt like home. The hot tub is amazing and the view was even better. We will be back again!. Thank you for having us. Thumbs Up! This is a great place! Very nice view, very clean, Beautiful location! We all loved the cabin. We loved Bryson City especially with all of its summer activities. Thank you. What a wonderful place! We enjoyed a much needed get a away and you place was perfect. What a view, it was like no other. a cozy hot tub and a relaxing porch with rockers are great. We enjoyed reading your great book and tried several of the suggestions. What a beautiful cabin and even better view. The atmosphere was relaxing we didn't ever want to leave. Everything was high quality all around and we can't wait to come back again. We had a great time staying here, it was so good to experience a trip like this. Although we didn't have enough time to enjoy the hot tub because we were out most of the time. We put everything back where it was. This cabin was lucky for us. We had a fantastic stay! The house is perfect and full of surprises! Like the games in the cabinet and washer and dryer. We will be back. The hot tub was amazing. the cabin was very clean thank you.